I can't walk past a Duane Reade without buying candy corn, and every vacant store front is advertising a costume store coming soon - there is no denying it, it's a Halloween time of year. Instead of stocking up on devilish sweets, unwind with a colorful cauldron of bath time bliss! 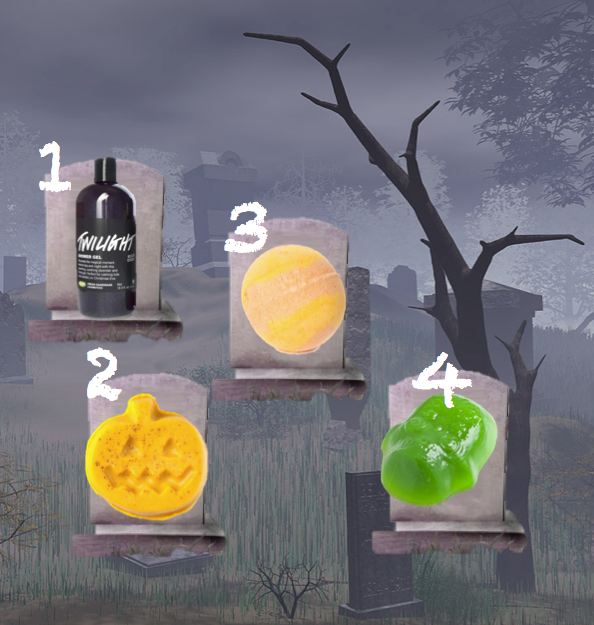 We always love LUSH, so we were thrilled when they unveiled these frighteningly fun shower and bath goodies to help us celebrate the spookiest month of the year. Launching just in time for the spookiest night of the year, anyone in need of a good night’s sleep will love this lavender-laden shower gel. Inspired by our best-selling bath bomb Twilight, it contains a blend of deeply relaxing essential oils such as lavender flower infusion, lavender oil and ylang ylang. Use this relaxing, soothing, deep purple, twinkly shower gel to calm your mind and get you ready for sleepy time. We’re not saying it can keep the bogeyman at bay – but it certainly can’t hurt. This limited edition soap is back with its gorgeous pumpkin shape and colour, and packed with the rejuvenating scent of cinnamon. Clove, cardamom, spearmint and fresh pumpkin will warm you up after a long night of trick or treating. Make some magic in the bath on Halloween with this spirited fizzer! A colour-changing wonder, Enchanter brings busts of oranges and pinks to your bath while the citrus scent lifts your spirits. Calacas means skeleton in Spanish, and this colourful green jelly will get you squeaky clean – no bones about it. The energizing scent of lime and neroli perks you up and gets you moving, while the aloe vera gel gently softens skin. Especially good frozen, they make for a sharp shock in the morning for all you lazy bones! Available starting October 1st on LUSH.com and October 13th in LUSH shops, be sure to get your claws on these ghoulish goodies while you can!